The Whitehall Board of Education took a few moments to honor the district’s top students during Monday’s monthly meeting. 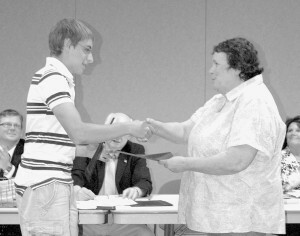 Board president Virginia Rivette presented salutatorian Jordan Eggleston with two certificates of achievement—one from the district and one from the Washington County Board of Supervisors. During his time in high school, Eggleston compiled a 94.9 grade point average. He will attend SUNY Adirondack in the fall. The board also honored valedictorian Paxton Peterson who was unable to attend. Peterson compiled a grade point average of 95.3. She will attend Russell Sage College. The adulations weren’t limited to students. The board also recognized several longtime teachers and presented board member Bruce Wescott with a certificate of appreciation. Wescott has served on the board for the last five years and will step down on June 30. Watson said work on the roof over the high school swimming pool continues to progress. Crews have completed installation of the roof itself and have only to install vents and skylights to complete that phase of the project. The work will then move to the cafeteria roof, likely by the first week of July. “We’re on budget and ahead of schedule at this point,” said Watson. Voters approved the $240,000 project to replace the roofs by a 65-0 margin earlier this year. Board members approved a request to allow juniors and seniors to attend a trip Costa Rica next March. Watson said officials have changed the itinerary so that it is more service oriented. During the trip, students will visit Costa Rican schools and work to clean up mangroves. “We feel this is more in line with the spirit of the school,” Watson said. The trip is held every other year and students and their parents pay the cost of the trip. Typically 20 to 25 students attend. The board established a tax certiorari reserve in the amount of $100,000 for payment of judgments or claims arising from tax disputes. The board will hold its annual organizational meeting at 7 p.m. on Monday, July 8.